Thanks Perodious. Any other opinions on the tiers? For playing with fun, Tiers don't really matter because all characters can beat all characters (If you get what I mean). Even in competition tiers will have little difference into how you play (I think...). K, just to clear things up, heh heh heh. ok forget the part about being old, just funny. If, and thats a BIG if, I can master Yoshimitsu (1 to a unknown number chance) Wang would probably be my second character. Luckily for us, Yoshi gets boosted up! YEEEEAAAAH! About Tekken 5.1, What are they going to do about the PS2 version? What is this tekken 5.1 you speak of? :O_o Excuse my ignorance. It's just an upgrade of Tekken 5 with some tweaks and adjustments. It's an Arcade version upgrade though; it won't be released on console. Speaking of which, rumours about Tekken 5.2 have already spawned (waits for new characters). My favourite character is King. I love King so much...The it would be Craig Marduk, and then Yoshimitsu. i think im the first to say that Baek Doo San is my favorit, together with armor king.. ;)..
and after those i got the good old yoshi..
'Shingo'... brings back memories of the old RPG game we used to have. I would just like to say, Welcome and enjoy your stay, to the both of you! PS: Armor King rules, 'nuff said. 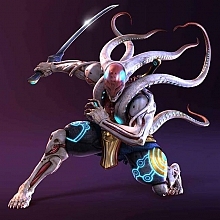 Yoshimitsu. No doubt in my mind. It's, of course, unfortunate Yoshi being lacking of so many things. And another thing is that it really don't make any sense. It is no secret that Yoshi is getting older, and that he might even be as old as Heihachi - maybe even Wang. But he has starred in every Tekken games so far. And judging from that it makes absolutely no sense in my mind that he don't get better from all those previous tournaments etc. But, on the other side i really dislike the idea of Yoshi becoming the top-character in Tekken. 'Cause i wouldn't feel glad if i beat my opponent. The honor in winning would just be - gone. And so it irratates me when people comes with comments like "Theres too much work in him" or "You need to start playin' a high-tier!" - "Too much work"!!? I hope i heard you wrong there. If you're not ready to work for your victory, and instead chooses out from what you're most likely to win with, i think your intentions at playin' tekken is wrong. Having fun while playin' instead of a burning desire for victory is not clean intentions if you ask me? So i keep playin' who i think is fun to play instead of one im more likely to win with. Even if i know it ends up causing me my victories. A person being more pleased from victory than anything is likely to have fun with just one botton on the pad - an instant kill botton; "Press me and win". I'll keep playing what catches my interest, what i think is fun to play, what entertains me the most, what i find more difficult to play- and requires better skills etc. Than a joypad with one botton. And that my friends are Yoshimitsu - Even if it shows he a 397 year old Alien from space.